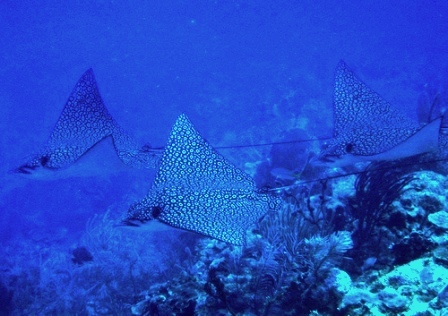 Spotted Eagle Ray - a sight to remember! 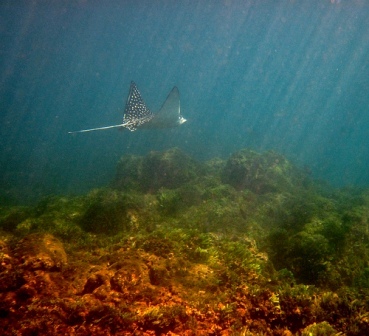 A spotted eagle ray caught my eye while snorkeling at Goodman's Bay, Nassau, in the Bahamas. These majestic reef species are excellent swimmers and love to 'fly' out of the water, breaching its surface several metres into the air. Here are a few fun facts, they love to feed on shrimp, crabs , bi-valves and octopuses . You can't miss these sea creatures with numerous white spots on their dark brown dorsal surface and long whip-like venomous tail. They can grow as long as 5m (16.5ft) and weigh 230kg (500lbs) with a wing span of 3m (10ft). They love to swim in groups and can be seen at the surface to depths of 80 metres. While diving or snorkeling in the Caribbean, you can look out for eagle rays from as far as Bermuda in the north to Brazil in the south.